Revenue in the Home & Laundry Care market amounts to US$25,127m in 2019. The market is expected to grow annually by 0.8% (CAGR 2019-2023). 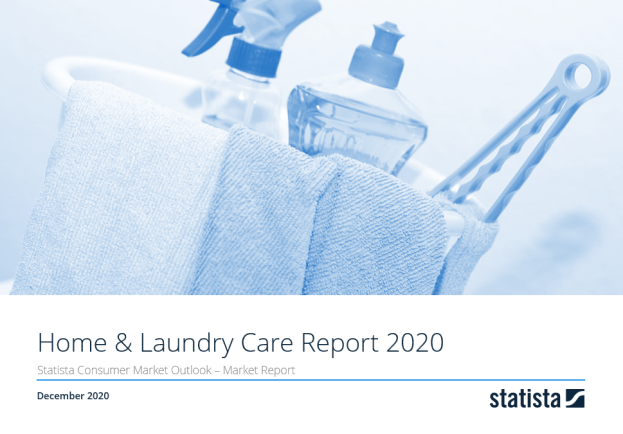 The market's largest segment is the segment Laundry Care with a market volume of US$12,825m in 2019. In global comparison, most revenue is generated in United States (US$25,127m in 2019). In relation to total population figures, per person revenues of US$76.35 are generated in 2019. The Home and Laundry Care market covers cleaning products for private households. The market is differentiated by application fields: Laundry Care covers detergents for fabric care. Household Cleaners cover household detergents for surface care (incl. bleach and toilet care products). Dishwashing Detergents contains detergents for washing dishes and cutlery, and Polishes, Room Scents and Insecticides cover the remaining specialty products. The market takes into account consumable detergents for use in private households only (B2C). Auxiliary cleaning equipment (e.g. mops and brooms) are not included in the shown sales figures. Also excluded are professional products for industry use or household cleaning services (B2B). The market for Home and Laundry Care products is characterized by relatively low growth rates and is dominated by a few big brand manufacturers such as Procter & Gamble, Unilever, Reckitt Benckiser, Henkel, Kao and Lion. Reading Support Revenue in the Home & Laundry Care market amounts to US$25,127m in 2019. Reading Support The Home & Laundry Care market is expected to show a revenue growth of 1.0% in 2020. Reading Support The average revenue per person in the market for Home & Laundry Care amounts to US$76.35 in 2019. Reading Support In the Home & Laundry Care market, 16% of total revenue will be generated through online sales by 2023. Reading Support With a market volume of US$25,127m in 2019, most revenue is generated in United States. Here you can find more studies and statistics about "Home & Laundry Care".